Need affordable tree service in Watauga, TX? Let us help! Professional tree service company. Watauga, TX one of the many suburbs of DFW we service. We are a locally-owned family business with hundreds of references in the DFW area available upon request. Get started today with an affordable quote. We cut out the middleman and pass our saving on to you, saving hundreds of dollars in most cases. 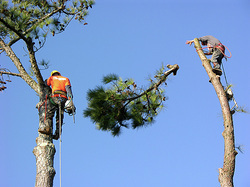 No job is too big or too small and we handle commercial tree work with ease. Tree soil drainage tip: A small mound of earth 3-6 inches high can abe built around the outside edge of the planting hole to create a saucer effect to aid in thorough watering. This ring should be removed after the tree has been planted in one year. Since these rings aren't attractive, they can be eliminated from the start if you are very careful to soak the root ball every two weeks during hot months. Habit: Spreading branching structure, large leaves up to a foot each. Thick, corklike stems, branches and trunk. Fast-growing oak. Can grow as high as 150'. Culture: Easy, any well-drained soil including solid rock. Drought tolerant. Grows almost anywhere in the USA. Uses: Handsome and hardy shade tree. Notes: Native to Texas and Oklahoma, we love the Bur Oak!